The United States Congress designated the Wellsville Mountain Wilderness (map) in 1984 and it now has a total of 22,843 acres. All of this wilderness is located in Utah and is managed by the Forest Service. The Wellsville Mountain Wilderness extends along the high steep north-south ridge and both sides of the Wellsville Mountains for about 14 miles. 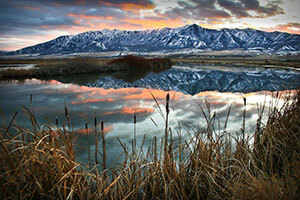 It is located in Northern Utah southwest of Logan, Utah and encompasses extremely rugged and picturesque terrain. The mountains are one of the narrowest and steepest ranges in the Rockies, averaging only about five miles wide at its base and rising to its tallest summits, the Wellsville Cone at 9,356 feet and Box Elder Peak at 9,372 feet. Canyons cut into the mountains from the east and west. The water that runs out of the Wellsvilles is enough to supply many small Utah communities. Once devastated by overgrazing, the wilderness is on the road to recovery and now supports populations of deer, moose, and mountain lions, not to mention the occasional bighorn sheep. Raptors use this mountain range as a major flyway and the Hawkwatch International organization comes to the range frequently to record observations. Day hikers and hunters are the primary human users. There are only a few system trails in this wilderness area and access and trailheads are limited. There are 3 system trails totaling approximately 17 miles of system trails exist in the Wellsville Mountain Wilderness. Planning to Visit the Wellsville Mountain Wilderness? How to follow the seven standard Leave No Trace principles differs in different parts of the country (desert vs. Rocky Mountains). Click on any of the principles listed below to learn more about how they apply in the Wellsville Mountain Wilderness.